And My Humiliation is Complete, or Maybe it’s Time to Cut the Cord? Walking with Shiva has been a bit of a trial these past few weeks. It has nothing to do with the weather; I am actually getting over that. Minus twenty-five has become quite livable. Minus fifteen is flip-flop weather. No, my recent aggravation has much more to do with Shiva’s numerous leash transgressions. I was willing to give her the benefit of the doubt. Instead of automatically jumping to annoyance, I thought the reason she was pretending to forget her manners was because she was cold. Even in her hand-made coat, the temperatures have been low enough to freeze anyone within ten minutes. Without any fur on her belly, she is more vulnerable than I am in my winter clothing. I was sensitive to this for obvious reasons and cut our jaunts short. However, this past week has been much “warmer” and tonight was downright tropical. After all, I was only wearing two sweaters and one pair of socks. It is practically Arizona out there. Shiva’s behaviour remained unchanged. If anything, her tugging was worse. I am not a patient person at the calmest of times but I have grown a lot during my time with the wingnut. I think I have developed a few coping mechanisms that keep me from having a tantrum in the middle of the sidewalk. That hasn’t occurred for at least two days. Of course, this time, it all went down in front of an audience. 1. Shiva leaps like an antelope down the street. 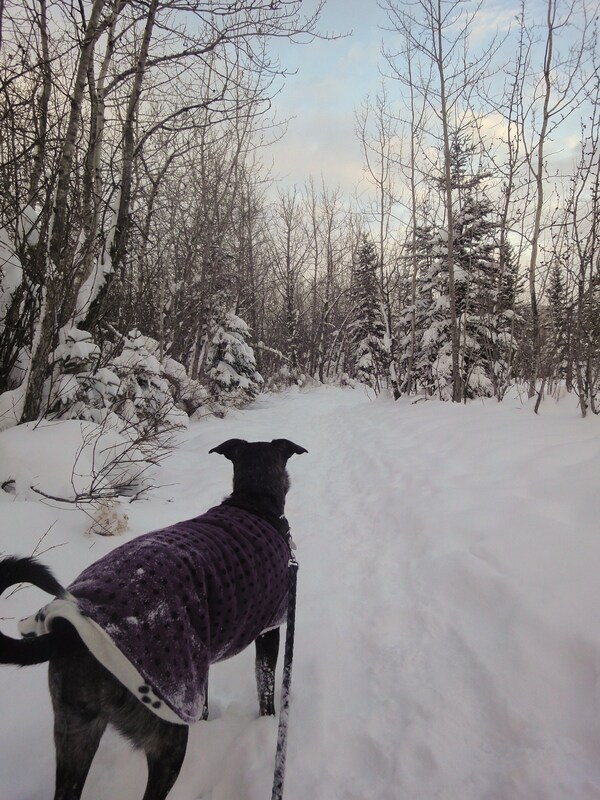 I grip the leash and follow along behind her, slipping on the icy road. 2. I gain traction and stop, forcing Shiva to halt and look back. I raise my eyebrows whereupon she usually races back to my side and sits down to await my direction. This is what I expected to happen. This is what I have taught Shiva to do. 3. When I relaxed my shoulder, Shiva swung around and bolted ahead, ripping the leash out of my mittened hand. 4. I watch helplessly as Shiva speeds down the sidewalk, calling to her but knowing it is useless. The children, standing with their parents on the other side of the street, start laughing. 5. Shiva veers to the right, bounding through the snow in the school yard, a giant grin on her face. 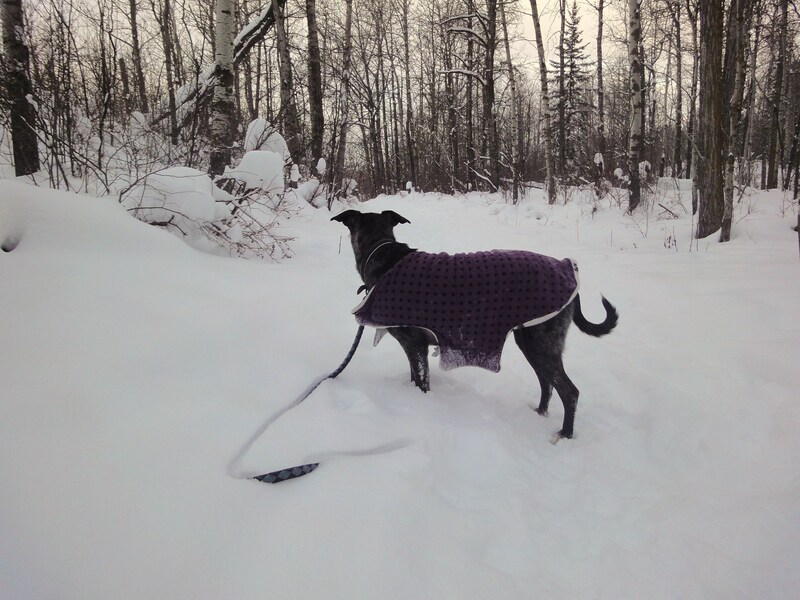 Her purple coat comes loose and flaps around her shoulders. 6. I stand there feeling like a moron but finally catch Shiva’s attention. After running back and forth in the snow piles for a few more seconds, Shiva turns in my direction and races to my side, eyes sparkling and tongue hanging out. The children make sounds of disappointment. 7. Picking up the ice-covered leash, I move forward with Shiva who instantly starts to pull. I sigh and stop. A rabbit runs across the road in front of us. 8. Shiva’s ears pop up and we walk for the next three blocks with her on her hind legs. The children cheer. Have you ever walked a dog who is walking only on her two back legs? I have several times. Sometimes it’s just awkward, other times I worry she is freaking out the pedestrian she is staring at on the other side of the boundary, but tonight it was just embarrassing. 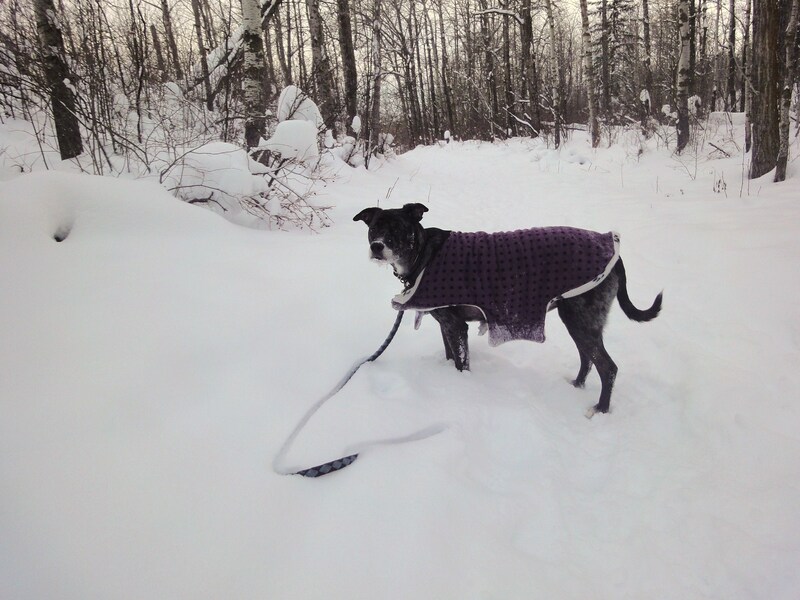 After all of this, I am starting to wonder if the cause of Shiva’s lack of self-control – okay, more than her usual lack – is because I have not let her run off-leash since November 3rd. A Shiva needs to run as much as a Shiva needs to chew. It is a big part of her personality and how she has fun. I have taken this away. For a good reason, maybe, but she doesn’t know that. All she knows is, she has energy to burn and wants to run. And run, and run, and run. Maybe it is time to take a risk? Trust in the fact that her injury could have been a one-off? I was came close last Sunday. We were walking in the ravine and met up with two dogs whom I have always secretly hoped would one day be Shiva’s friends. They are both friendly, well-socialized animals and under ordinary circumstances I would love for Shiva to run around with them. The owner was amendable, the energy was positive, there was no reason to disallow Shiva a chance for fun. Except the biggest reason of all: fear. I don’t know. It feels too soon. I’m not sure I am capable of un-clipping that leash knowing what might happen. I know I will need to. Regardless of the dangers, it does seem wrong to prevent Shiva from indulging in her favourite activity. A Shiva isn’t a Shiva if she is inhibited by my paranoia. But at the same time, it is my job to keep her safe. Even if she never runs off leash again, isn’t it more important to keep her alive and free of serious injury? I don’t know how parents of human children do it. Cutting the cord might take more guts than anything I have done before. you need to let her run – buy insurance maybe – but let her run. You cannot wrap her in bubble wrap and expect Shiva to be Shiva. This advise comes from a mother who made three trips to the emergency room with my oldest child for stitches – all before his first birthday. You have to protect as much as you can – but you can’t prevent all accidents and injuries. You just do the best you can – and hope for the best. I know this apprehension. I know I can trust Moses in most cases, but Alma still worries me sometimes and I’m hesitant about her off leash time and let it stress me out a little. The Husband is way more relaxed and takes way more risks (I see them as risks, he sees them as privileges, because he doesn’t have the same hang-ups) with her off leash. And his being more permissive and giving her more opportunity and experiences has only improved her off leash skills. So I know I just need to swallow my fear sometimes – it’s in the best interest of both me and Alma. I’ll never build up a history of trust and good behaviour if I don’t give her the opportunity to prove it. Totally understand how you are feeling, BUT stopping shiva from running free is like stopping a bird from flying. Of course you need to take care of Shiva. Is there an enclosed area you could let her off in to start with? maybe Shiva has learned from her experience ? sounds like she needs a good run…. maybe she will never do something so silly again! I would be right there with you. What a decision to make. Now that we are in the desert I’m very hesitant to let Torrey off leash. She likes to hop through the bushes and chase things. Except now, the bushes have big stickers and there is cactus. She’s not really happy about this situation. Resigned maybe. The fact that you are agonizing over this decision is what makes you a wonderful pet parent. I have no doubt that when the time is right you will cut the cord, you’ll be nervous but you will know it is time. My Eskie NEVER walks down the street on her hind legs….. She hops! Letting your dog or children off leash is always a difficult decision. But you don’t want them to be emotionally staved for lack of freedom. My suggestion is to buy pet insurance so that you have some protection…which you will probably not need. Plan for a catastrophe and they seldom happen. We only let Maggie and Duke off leash in fenced areas. Sometimes I let them go off leash just across the driveway at my parents’ to the entrance to the fenced garden, but the last time Maggie took off down the driveway and down the road. Luckily she came back, not without giving us a heart attack! We have 20 foot lunge lines that we walk the dogs on, it gives them some freedom and keeps them safe. You can find them up to 35 feet long at places that sell horse equipment. They’re half the price of dog training leads and are much more durable, I’ve had one for almost 20 years. I’m sure despite your humiliation and Shiva’s disobedience – those children were super delighted at her antics! You probably made their day a little brighter! Pretty much every place in Arizona has a leash law so I’ve never had this dilemma. I’d say if Shiva looks like she’s pretty much recovered, it’s time to let her run free. I’d prepare myself with lots of high value treats though – because I am sure those first couple of times she will go a little nuts and may “forget” some of her recall training since she’ll be so giddy with finally being leash free.